In the early, early mornings I go off in my van to shop. It's just me, the van and the sunrise, and the sky turning the colour of the flowers: rose-pink and sun-yellow, orange and red.A celebration of the role of flowers in special occasions by Australia's most creative florist, Saskia Havekes of Grandiflora. Flowers provide that special something that can take an event into the realms of the extraordinary, and internationally renowned florist Saskia Havekes has helped create some of our most spectacular celebrations, from weddings, birthdays, and Valentine's Day gifts to fashion shows, gala dinners, and the Logie Awards. In Grandiflora Celebrations, you are invited to explore behind the scenes as she prepares arrangements in beautiful private homes and public spaces. Photographer Andrew Lehmann captures the unfolding story of each event as Saskia and her team display the creative vision that has won them such acclaim. We follow them as they visit growers, prepare the blooms for display, and produce installation onsite. There are over 60 arrangements to delight and spark the imagination, from floating wreaths and floral chandeliers to dressing tables and weddings concepts. There are living works of art that show Saskia's ingenuity knows no bounds. Visually exciting, rich, and evocative, Grandiflora Celebrations is a tribute to flowers and their pivotal role in special occasions. It is also a portrait of an artist at work and a behind-the-scenes glimpse into 40 events captured over just 18 months. 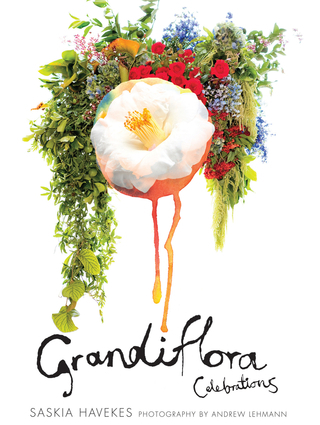 Saskia Havekes is one of Australia's most celebrated florists and owner of the inner-city Sydney shop, Grandiflora. Her clients include Armani, David Jones, Fairfax & Roberts, and Hermes, and her work has featured in Belle, House & Garden, Marie Claire, Vogue, and Vogue Living. Andrew Lehman studied photography at RMIT, graduating from Swinburne College. He works throughout Australia for prestigious magazines.